A version of the stories I am about to tell have happened to parents everywhere, I would imagine. One day at recess, Beth dropped down from the monkey bars. She landed on her arm, and complained about her arm hurting. The school nurse iced Beth’s arm. Beth’s mom couldn’t see anything wrong with her daughter’s arm, even though Beth still complained that her arm hurt. Finally, she took her daughter to the doctor. She had a hairline fracture and got a purple cast. If only she had known, she would have taken Beth to the doctor right away. Jenna’s mom fed Jenna a good breakfast and sent her off to school, just as usual. An hour later, as Jenna was working one-on-one with her second grade teacher, her breakfast came back up. The teacher sent Jenna to the school office, and Jenna’s mom came back to school to take her home. If only she had known, she would have kept Jenna home from school that day. I was Beth and Jenna’s teacher at the time, and now, I am Emmy’s mom. Emmy’s mom thought that it was a nice day for a walk. It was the beginning of spring, after all. Emmy was getting over a cold, and the fresh air would do them both some good. Emmy insisted she did not want to wear her hat. Emmy’s mom caved in, even though it was still a little chilly outside. That night, Emmy wouldn’t lie down in her crib. She cried on and off, and was obviously in pain. Emmy’s mom took her to the pediatrician the next morning, and sure enough, Emmy had an ear infection. If only she had known, she would have made Emmy wear her hat! You don't have to blame yourself. A hat off the head cannot cause an ear infection, I feel certain of it. I'm sure the infection was already there and the hat being off wouldn't have mattered, except to protect her ear from the wind and maybe hurting a little. You're a great mommy so no mommy guilt for you! (Even though you know I have tons!) Love the new look! Don't you hate Mommy Guilt? No matter what you do, you always wonder "Could I have done better?" Don't worry…every mom has this guilt and it never goes away from what I hear. Bummer. Haven't we all been there… great topic. Hope Emmy's better soon! Aww, poor Emmy. But you didn't do it, if her ear was infected that night, it was well on it's way to getting infected. I absolve you from mommy guilt. ;)Hope she's feeling better soon. Ear infections are the worst. You must not do this to yourself! Too much coulda, woulda, shoulda, oughta in the world. We all just do the best we can, with the information presented to us at the moment. There's always going to be things that happen where we're going to say if only I had known. But, we can't always know, and we can only do our best.Have a great week! 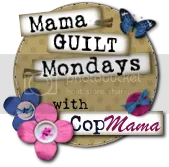 Oh, mama guilt! Too bad we don't develop ESP instead. Oh no! They set up a day to feel guilty??? STOP!! We all do the best we can and none of us are perfect! Hang in there!And welcome to the SITS community! Oh yes we have all been there. Don't feel too guilty, really we can't always know. I know, you think everything is okay and then later on, you realize…oops! But as moms, if we instantly reacted every time, we would be over-reacting. So I believe we do the best we can and our kids are resilient. They will be fine! I hope your little Emmy feels better soon.Thanks for linking up and telling YOUR story! I remember when my kids got ear infections they didn't even cry and the doctor would tell me how HORRIBLE the infections were. I felt like a loser mother because I had no idea they were even sick! I totally agree – wouldn't it be nice to have a crystal ball to tell you if it's worth the fight or not? I know I often "cave" against my better judgment…and then end up kicking myself because I DID know better but just didn't want to ruin the good moods. I know the feeling with the hat. Yesterday we let our son play outside without one and he really should have had it one. I am so hoping we don't see an ear infection.Have a great Monday!